Fresh and colorful, packed with protein, minerals and vitamins, this salad becomes a meal in itself when served with hearty bread. For biggest flavor, shred your own carrots rather than buying them already prepared. 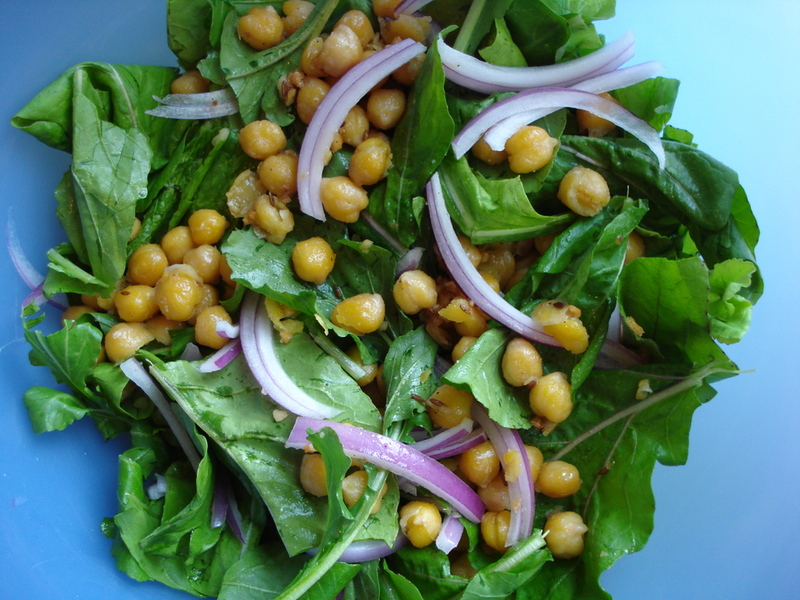 Combine the arugula, chickpeas, carrot, parsley, onion and mint in a salad bowl. In a small mixing bowl, whisk together the lemon juice, honey and bit of salt and pepper. Toast the fennel seeds in a skillet over high heat, tossing often, until fragrant, about 30 seconds. Stir into vinaigrette and whisk again. Pour dressing over salad, toss well and serve. Serves 4. This entry was posted in Recipes, Recipes from Danielle's pantry, Salads, Vegetarian and tagged arugula, carrot, chickpeas, fresh herbs, herbs, lemon, mint, Onions, vegetarian. Bookmark the permalink.